The QUEST team is always eager to engage the public – even if that means enduring the chilly winds of the Berlin Underground! 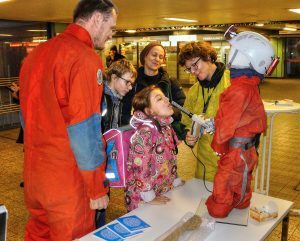 MindTheLab – Science in the Metro (http://www.mindthelab.org) is a new communication approach that aims to connect scientists with the general public. After the first event in Athens, MindTheLab came to Berlin on the 8th of November and we (Norbert and Seb) participated in the event by setting up a booth at the U-Bahn station Möckernbrücke. Starting in the early afternoon, we talked to all interested people about climate research. We had many interesting encounters and highly engaging discussions. Although at times we felt like Jehovah’s witnesses trying to distribute leaflets, it was exciting to be able to discuss with people about climate change, climate impacts on society, and lack of political will to respond urgently to climate change. We received nearly 100% positive feedback, with many expressing their gratitude to climate scientists in general, and also for our active engagement at Möckernbrücke in particular. The only thing we missed were a few politicians to discuss with – but then again, who would expect them to travel with the Underground…?! We will certainly continue to engage the public – next time in 2019 at the Long Night of Science in Potsdam! See you all there!